Did you know, 90% of the managers consider certifications as the most trusted way to vet resources while making hiring decisions? Oh yes, if you are not certified, then the chances to clear screening phase are negligible. So, according to you, when a Microsoft Partner needs a Microsoft Dynamics 365 resource, whom they will choose? The one who is certified or the one who has no certification and knowledge? Of course, the the one who has knowledge, he's certified and knows how to execute and manage dynamics projects. Right? #1 You study for Microsoft Dynamics 365 Customer Engagement Online Deployment i.e. MB2-715 Certification. This certification tests your knowledge about the online deployment of Microsoft Dynamics 365. 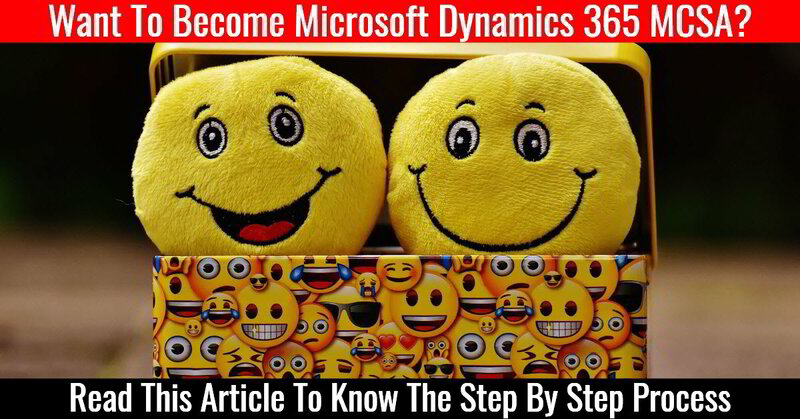 #2 You study for Microsoft Dynamics 365 Customization & Configuration i.e. MB2-716 Certification. This certification test whether you can customize the CRM application for dynamics 365 application and you can configure the application as per customer requirements. Once you prepare and pass these two certifications, you become MCSA. Looking for the step by step training and practice tests? Attend this free training to learn about this in detail and also get all the certification courses at a huge discount. Click here to register (limited spots). Enjoy the training and I look forward to your success story.